ASME Code Section VIII, Division 1, 2017 Edition offers four different formulas for the internal pressure design calculation of cylinders. The results slightly differ depending on the formula used. It´s up to the user to select the formula. It must be noted, however, that formulas I and II from UG-27 and Appendix 1-1 (Supplementary Design Formulas) can only be applied for thin walled cylinders, while formulas III and IV are applicable for both thin and thick walled cylinders. As is usual with all ASME Code formulas, the dimensions used have to be considered for the corroded condition. Corrosion allowances (and tolerances) have to be added to the results. 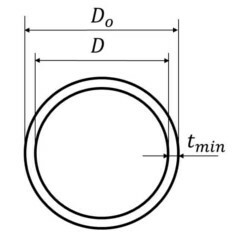 The allowable stresses are listed in the ASME Code Section II, Part D. For pressure bearing components which are to meet the ASME Code requirements, only these allowable stress values or those from approved Code Cases are permitted. The correct efficiency factor E for longitudinal seams (Category A) are determined according to paragraph UW-12. Brief instructions for the determination of the correct efficiency factor are available in our ASME Code Tutorials (German).